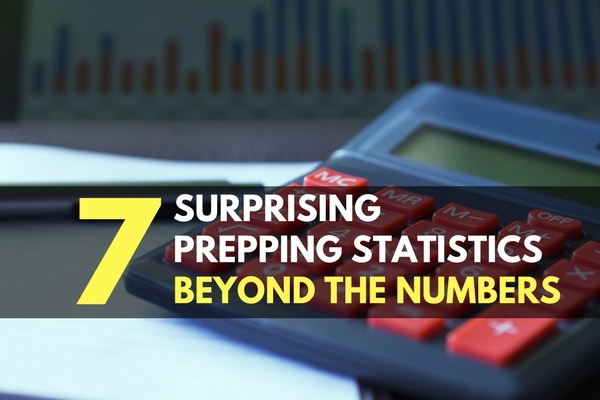 Prepping statistics are almost always surprising, but a few on this list may cause you to do a double take. Unbelievable stats can be harrowing and frustrating, but they can also motivate logical people to be even more prepared. Before we get too far into the discussion, I’ll go ahead and admit it; I’m a data nerd. If you haven’t gathered that fact by seeing me crunch the probabilities, impacts, and tangible risks into our TrueRisk index- then you haven’t been paying attention. Numbers and statistics can provide very clear pictures of what is going on in the world. 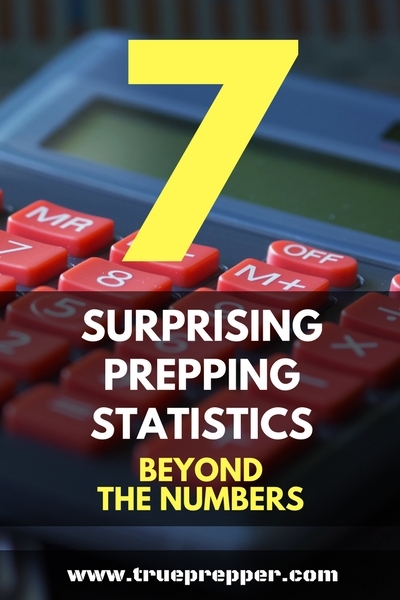 Prepping statistics are particularly useful for convincing others how important being prepared actually is. Sometimes stats can catch even a seasoned prepper off guard with shocking evidence of the importance of preparedness. I’ve grabbed the prepping statistics that have caught my eye over the years and share them below. Feel free to share with any ‘naysayers’ who feel that a prepping lifestyle simply isn’t important. Going well past any possible increase of disaster exposure, population growth, and inflation- this giant growth can be attributed to a cultural change that has de-valued the importance of prepping and preparedness. In 1953 there were no ‘preppers’- only everyday people living their lives according to the risks they knew rather than the risks they chose to ignore. This is surprising considering that these are the same people that see the impact of disasters and emergencies all the time. People that understand the fragility of the human body would seemingly take care to prepare for emergencies, and especially pandemics, in their situation. This statistic just seems crazy. First aid kits are so cheap and readily available; I just take for granted that most homes would have these. I would be interested to see this stat for other countries to see if it goes up or down. While it may seem low, ‘shockable treatment’ is at a whopping 57% survival rate. This is a good reason why AEDs are a good investment for first responders, businesses, and communities. Even the 20% survival rate is great when compared to 0% when you are untrained in CPR. While this sounds ridiculous, most people rely on their cell phones and the one touch dial to contact each other. Learning an “ICE (In Case of Emergency)” phone number and making an emergency contact list is a great way to get prepared for any simple emergency. Social Security cards, birth certificates, passports, and photo IDs are all important to have if you are bugging out, displaced, or just need them in an emergency. Waterproof and even better: fireproof pouches are great for stashing these items where you can grab them in a hurry. Disaster Resilience: A National Imperative (Print Book) by National Academies, Committee on Science, Engineering, and Public Policy. Statistics can either be boring and mundane, or a tool you can used to convince others of the importance of prepping. Some do not care for the numbers or the bigger picture and are better swayed with anecdotal stories. This is where sharing your own experiences can help. I prefer to use numbers and my personal experiences together to share how important being prepared actually is. Keep exploring, stay prepared, and be safe.